Former Iraqi Prime Minister Muhammad Hamza al-Zubaidi, a close associate of Saddam Hussein, has died, the US military has confirmed. A spokesman said he died on 2 December in a US military hospital in Baghdad after "complaining of chest pains". 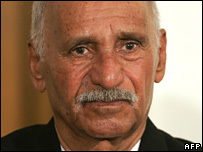 Mr Zubaidi had been expected to appear at the tribunal in Baghdad on charges of crimes against humanity. Although a Shia Muslim, he was accused of leading the suppression of a Shia uprising in southern Iraq in 1991. Tens of thousands of Shias were killed by Iraqi security forces in response to the rebellion. Mr Zubaidi was appointed prime minister and a member of the Baath Party's Regional Command Council (RCC) shortly afterwards. He was succeeded as prime minister by Saddam Hussein in 1993. Mr Zubaidi was commander of the Central Euphrates Region prior to the US-led invasion, and was captured in Hilla on 21 April 2003. Mr Zubaidi's death only became known when Saddam Hussein's half-brother complained to the Iraqi Special Tribunal about poor medical facilities for detainees. Barzan al-Tikriti, who is suffering from cancer, cited the death as a reason not to use the US military's hospital. On Saturday, the US military spokesman, Lt Col Guy Rudisill, had issued a statement regarding a death in custody, but did not give a name. "A 67-year-old male security detainee was pronounced dead by the attending physician at the 344th Corps support hospital at 0730 on 2 December," the statement said. The US military said Mr Zubaidi's identity had not been made public in order to give time for his next of kin to be informed.